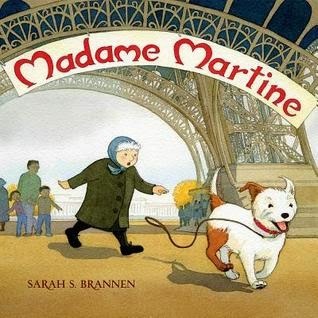 For some reason I am a total sucker for picture books that take place in Paris (and of course NYC). Just something so adorable and whimsical about them. Here is one of my new favorites. Summary: Madame Martine is stuck in a rut. She follows the same routine every day and doesn't see any of the beautiful things around her (I can relate because I feel like I miss the beauty in New York sometimes too.) She refuses to be a tourist in her own city and enjoy things like the Eiffel Tower, that is until she finds a little stray dog and her whole routine gets turned upside down. My Thoughts: Great illustrations and a sweet little story that reminds us all that we need to appreciate the beauty in the things around us.